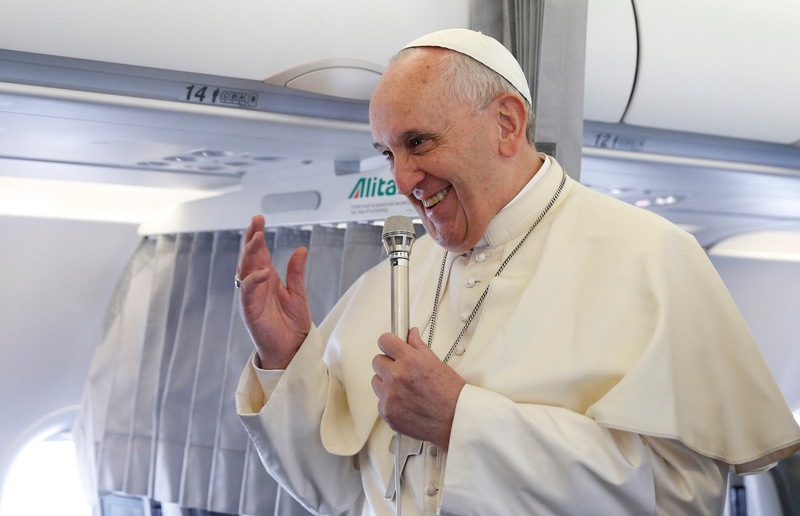 Catholic News World : #PopeFrancis Apologizes to Abuse Victims at Papal Plane Interview “covering up abuse is an abuse in itself,"
#PopeFrancis Apologizes to Abuse Victims at Papal Plane Interview “covering up abuse is an abuse in itself,"
“I apologies if I have hurt the victims of abuse with my words on the Barros case”. Pope Francis, answering the journalists’ questions on the flight from Lima back to Rome, admits that he made a mistake in expressing himself on the case of Juan Barros, the Chilean bishop of Osorno, challenged by groups of faithful in his diocese who believe he was aware of the sexual abuse committed by his mentor Father Fernando Karadima and that he had covered them up. In the margins of the mass celebrated last Thursday in Iquique, Francis had answered the question of a local reporter, stating he was willing to evaluate the “proof” on Barros if presented to him and adding that he considered as “calumny” the accusations made against the bishop. Words that provoked a strong reaction from the victims of abuse in Chile and had Cardinal Sean O’ Malley release a statement regarding the matter. But the Pope also spoke about the now famous wedding aboard the papal flight. Francis defended his choice by explaining that the couple was well prepared, had followed pre-marriage courses and approached the sacrament of penance. Finally, Francis called the trip to chile and Peru a “pasteurized” journey, like milk, because we passed from the heat to the cold through various climates. On the first day in Chile, you sent out a strong message against child abuse. But then you made that statement about Bishop Barros, speaking of “calumny”. Why do you not believe the victims and believe Barros? “In Chile, I have spoken twice about abuses: in front of the government and in the cathedral with the priests. I continue with the zero-tolerance started by Benedict XVI. And in five years I have not signed a single request for grace. If the second instance confirms the first, the only way out is to appeal to the Pope and ask for grace. In five years, I have received about 25 requests for grace. I have not signed one. About the Barros case: I had it studied, investigated. There is really no evidence of guilt. I ask for evidence to change my position. At Iquique, when they asked me about Barros, I said: “the day I will have proof I will speak”. I was wrong to use the word “proof”, I would rather speak of “evidence”: I know that many abused people cannot have proof. They do not and cannot have them, or if they have them, he or she feels ashamed of them: the tragedy of the victims of abuse is terrible. I happened to meet a woman who was abused 40 years ago, married with three children, who did not receive communion because in the priest’s hand she saw the hand of her abuser. The word “proof” was not the best, I would rather say “evidence”. In Barros’ case, I have studied and restudied, there is no evidence to condemn him. And if I condemned without evidence or moral certainty, I would commit a crime of bad judgment. I must explain that letter to you because it is in favor of prudence and tells of a 10-12 months long situation. When the Karadima scandal broke out, we began to see how many of the priests he had tutored, had been abused or carried out the abuses. There are three bishops in Chile that Karadima sent to the seminary. Some people of the Episcopal Conference had suggested that they renounce, take a sabbatical year to let the storm pass: they are good, good bishops, like Barros who had twenty years of episcopacy and was about to finish his mandate as ordinary military. There was talk of asking him to resign. He came to Rome and I said no, because that meant admitting an assumed guilt. I have rejected the resignation. Then, when he was appointed to Osorno, this protest movement arose: I received his resignation for the second time. And I said: no, you continue! Barros has continued to be investigated, but no evidence emerges. I cannot condemn him, I have no evidence, and I am convinced that he is innocent. And what about the reaction of the victims to your statements? I must apologize for what the abused feel. The word “proof” has hurt many of them. They say: Do I have to go look for a certification? I apologize to them if I hurt them without realizing it, I didn’t’ mean to. And it causes me so much pain, because I meet them: in Chile two meetings are known to the public, the others have not been disclosed. In every trip, there is always a chance to meet the victims, the meeting of Philadelphia went public, but not the other cases. To hear that the Pope tells them: “bring me a letter with proof, is a slap” I realize that my expression didn’t come out very well, and I understand, as Peter writes in one of his letters, that the fire has risen. That’s what I can honestly say. Isn’t the victims’ testimony an evidence for you? There is no evidence of this either.... My heart is open to receive them. How did you react to Cardinal O’ Malley’s statement on how your word “calumny” about Barros case caused great pain for the victims? O’ Malley said that the Pope has always used “zero tolerance”... Then there is that “bad choice of words”, I spoke of calumny, to say of someone who says something with pertinacity without having evidence. If I say: you stole, and you have not stolen, then I am libeling, because I have no evidence. It was an unfortunate expression. But I have not heard any victim of Barros. They did not come, they did not show themselves, they did not give evidence in court. It’s all in the air. It is true that Barros was in Karadima’s group of young people. But let us be clear: if you accuse someone without evidence with pertinacity, that is calumny. However, if a person arrives and gives me evidence, I will be the first to listen to them. O’ Malley’s statement was very right, and I have thanked him. He spoke about the pain of victims in general. The Vatican Commission for the Protection of Children have expired. Does this mean it is no longer a priority? The committee had been appointed for three years. Once it expires, a new committee will be studied. It was decided to renew the membership and appoint new members. The definitive list of names arrived before the beginning of this journey, and now it will follow the normal procedure of the Curia. We are studying the new resumes. There were a couple of remarks that needed clarification. But don’t think that we are not going to do it.... these are the normal times required. How do you respond to those who say that your visit to Chile was a failure, for the few people, and for the fact that the Church is more divided than before? This is the first time I have heard this. I am happy about the trip to Chile, I didn’t expect that many people on the street, and these people were not paid for coming! In Peru, the political class has cheated the people with acts of corruption and negotiated pardons (the reference is to the pardon granted by the current president to the former president Alberto Fujimori, ed). What do you think about it? I know that there is corruption in some European countries. And in Latin America there are many cases. There is much talk of the Odebrecht case (Brazilian company at the centre of accusations of corruption that also involve the Peruvian president Paolo Kuczynsky, ed), but this is just one example of the list. The origin of corruption is the original sin that leads us to this. I had written a small book whose message was: sinners yes, corrupted no. We are all sinners, when we commit a sin we realize evil and ask for forgiveness. Sin does not frighten me, but corruption does, because it spoils the soul and body. The corrupt is so self-confident that they cannot go back.... it is the destruction of the human person. Politicians have a lot of power, but the entrepreneur who pays half of what he owes to his workers is also a corrupt. A landlady who thinks she can take advantage of her housemaid or treat her badly is corrupt. I once talked to a young 30-year-old professional who treated his domestic staff in a non-noble way, he told me what he did. I told him: it’s a sin! And he said: let’s not make comparisons between these people and me, these people are there for this. This is what those who sexually exploit people think, those who exploit them with slave labor: they are corrupt. There is corruption also in the Church, let’s think about the Sodalizio case (secular movement founded in Peru by Luis Figari, now found guilty of abuse, ed). Yes, there is corruption in the Church. There have always been cases in the history of the church. The founder of the Sodalizio was reported not only for sexual abuse but also for manipulation of consciences. The Holy See carried out the trial, a conviction was given, he now lives alone, assisted by a person. He declared himself innocent and appealed to the Apostolic Signature, which is the supreme court of justice of the Holy See. But this trial was the opportunity for other victims to make a complaint both in civil and ecclesiastical proceedings. Much more serious things have emerged, civil justice has intervened - in these cases of abuse is always convenient that it does - it is a right - and I believe that the situation has become unfavorable to the founder. But he was not the only problem, there were other things that were not clear, of an economic nature. Sodalizio today is under investigation. A similar case is that of the Legionaries, which has already been resolved: Benedict did not tolerate these things and I learned from him not to tolerate them. After the marriage of the steward and hostess on the plane, what would you say to parish priests before couples who want to get married on planes or ships? “Are you thinking about wedding cruises?” One of you told me that I am mad to do these things. It was simple. The gentleman (Carlos Ciuffardi, ed.) had taken part in the flight the day before. She (Paula Podest, ed.) instead didn’t. He spoke to me. I noticed that he was testing me... it was a good chat. The next day both of them were there and when we took the photographs they told me that they were married civilly and that eight years before they were supposed to get married in the parish, but the church collapsed due to the earthquake the day before the wedding. And so there was no marriage. They would say: we’ll do it tomorrow, the day after tomorrow. Then life goes on: one daughter comes, then another. I asked them questions and told me that they had done their pre-marriage courses. I judged that they were prepared. The sacraments are for people, all conditions were clear. Why not do what can be done today? Waiting tomorrow would perhaps have meant waiting another ten years. Both prepared themselves before the Lord with the sacrament of penance. They told me that they had anticipated to some of you their intention: “Let us go to the Pope to ask that he marries us. I do not know if that is true. Tell the parish priests that the Pope asked them well, it was a regular situation. In Amazonia, you spoke of the “perversion” of certain policies that promote the conservation of nature without taking into account the human being. Do you think there is a kind of environmentalism that ends up being against humanity? Yes, I think so. The specific case I was referring to concerns that area of the Amazon: in order to protect the forest, some tribes have been cut off. The forest itself has ended up being exploited. There are statistics. Some tribes have been left out from the real progress. One of the Church’s aims is to combat poverty: Chile has lowered the poverty rate from 40 to 11 percent, and it is the result of a liberal policy. Is there any good in liberalism? We need to look carefully at the cases of liberal policies. Some countries in Latin America have implemented liberal policies that have led to the greatest poverty. I do not know what to answer, but in general a liberal policy that does not involve all the people, is selective and leads downwards. I don’t know the case of Chile, but in other countries it leads down. A news about Cardinal Oscar Andrés Rodriguez Maradiaga broke out: he would have taken money from the Catholic University of Honduras. What do you think about it? Cardinal Maradiaga has made a statement regarding the matter on television and I repeat what he said. What do you take you from this trip? “The impression of a faithful people who have gone through and still is experiencing many difficulties and yet have a faith that impresses me. A people who has expressed their joy and faith. They are an “insantata” land, the Latin American people have more saints. From Peru I take with me an impression of joy, faith, hope, and above all I have seen many children! The same image I saw in the Philippines and Colombia: moms and dads raising their children.... This speaks of future, it speaks of hope. Safeguard this wealth.